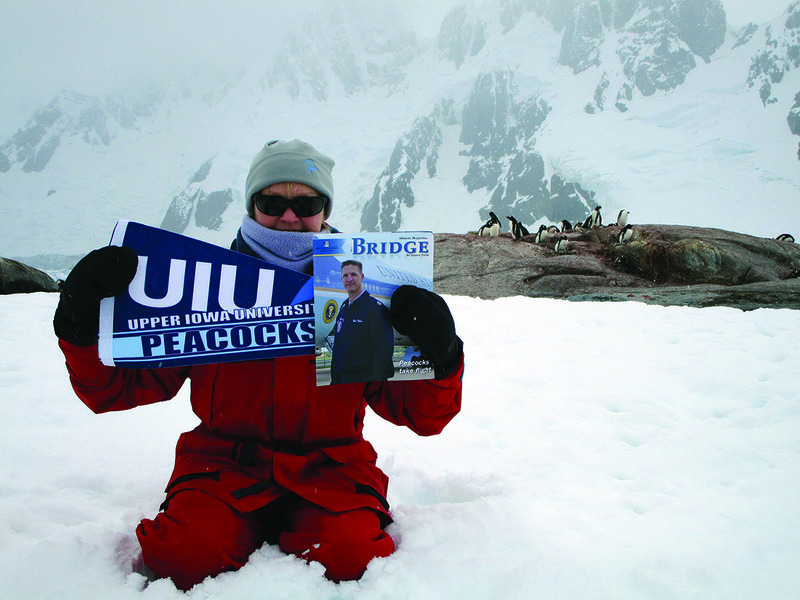 The Bridge in Antarctica. Behrens was joined by her children, Heather and Jeremiah, on the family expedition. It was the seventh continent visited by Behrens and her daughter. Dr. Jill Buchan, Des Moines, completed her doctorate in education, with a concentration in special education. Dr. David Cheng, Hong Kong, published the following articles: “How Creditors Evaluate Financial Statements?,” The Journal of International Management Studies, ISSN 1993-1034, Vol. 9, No. 1, February 2014 issue, “How to Protect and Increase Brand Equity?,” The Journal of Global Business Management, Vol. 10, No. 1, April 2014 issue “Benchmarking Human Resource Practices on the Web,” The Journal of Human Resource and Adult Learning, Vol.10, No.1, June 2014 issue; “Contributions of International Organizations towards Globalization in the 21st Century,” The Journal of Global Business Management, Vol. 10, No. 2, October 2014 issue; and “How to Improve the Training and Development Process of Corporate Bankers?,” The Journal of Human Resource and Adult Learning, Vol.10, No. 2, December 2014 issue. Dr. Billie Cowley, Fayette, was promoted to associate professor and granted tenure. Dr. Barb Ehlers, Fayette, published a co-authored paper with Jeannie Coughlin titled “Engineering Encounters – Think It, Design It, Build It, Test It, Refine It: A Unit on Water Quality Ends with a Water Filtration Engineering Design Activity” in Science and Children, February 2015, Vol. 52, No 6. She also wrote chapter 3 of Diversity Initiatives, Social Justice Matters and Culturally Responsive Family Engagement by Gloria Kirkland Holmes. Ehlers and Dr. Rick Klann received grants this past year. Ehlers received the REAP-CEP Grant: Energy Systems of the Prairie to fund the Environmental Issues Instruction program for teachers. Klann received the following: Evaluating the Effectiveness of Bioreactors at Nitrogen Removal – Iowa State Extension, Water Quality Monitoring in the North Fork of the Maquoketa River Watershed – Iowa State Extension, and Monitoring Total Phosphorus Levels in Volga Lake and Associated Tributaries – Fayette Soil and Water Conservation Districts. Ehlers completed her doctorate in education in curriculum and instruction from UNI this year. Dr. Nigel George, Fayette, was promoted to professor. Dr. Dawn Jacobsen, Fayette, was promoted to associate professor and granted tenure. Dr. Nick Serra, Fayette, presented a paper on Yeats and the North American Review 2015 at the University of Northern Iowa’s North American Review Conference in June. Dr. Meghan Jordan, Fayette, won the Distinguished Dissertation Award in English from Binghamton University. She published her article, “Madness and Matrimony in Frances Burney’s Cecilia,” in the summer 2015 issue of Studies in English Literature, 1500-1900, will be presenting at the annual meetings of Interdisciplinary Nineteenth-Century Studies, the Midwest Victorian Studies Association and the North American Victorian Studies Association. Mike Kimmel, New Orleans, published Scenes for Teens: 50 Original Comedy and Drama Scenes for Teenage Actors. Dr. Nadia Korobova, Fayette, was co-author of a peer-reviewed article in the January 2015 issue of the Journal of International Students, titled “A Comparative Study of Student Engagement, Satisfaction and Academic Success among International and American Students.” She also presented on “Harmonizing European Educational Content and Standards via the Bologna Process: Pros & Cons” as part of a Lunch & Learn Seminar Series for the Iowa Chapter of the Fulbright Association. Dr. Elbert Lee, Hong Kong, is contributing poet to a volume titled Desde Hong Kong, a commemorative poetry collection for the Mexican Nobel Laureate poet Octavio Paz. Lee has been appointed editor of City Upbeats, published by the City University of Hong Kong. Dr. Kata McCarville, Fayette, was invited to present her paper “Evolving Landscapes: Musings of a Roadside Geologist” at Iowa’s 28th annual Roadside Vegetation Management Conference. McCarville also presented her paper “Incorporating Systems Thinking and Tools into Undergraduate Earth and Environmental Science Courses to Reveal Relevance, Increase Understanding, and Deepen Learning” at the 2014 Geological Society of America Annual Meeting in Vancouver, British Columbia. Meghan Mettler, Fayette, published Modern Butterfly: American Perceptions of Japanese Women and their Role in International Relations, 1945-1961, The Journal of Women’s History, 26-4 (2014). Dr. Jerry Poppe, Milwaukee, was granted tenure. Dr. Rebecca Schmidt, Fayette, co-authored in two peer-reviewed journals “Mating and Memory: An Educational Primer for Use with Epigenetic Control of Learning and Memory in Drosophila by Tip60 HAT Action” in Genetics 200:1-8 and “Combining Clinicopathological Predictors and Molecular Biomarkers in the Oncogenic K-RAS/Ki67/HIF1a Pathway to Predict Survival in Resectable Pancreatic Cancer” in the British Journal of Cancer 112(3):514-22. Dr. Melle Starsen published “Cool to Be Cruel: Mean-spiritedness in 21st Century Children’s TV Sitcoms” in The International Journal of New Media, Technology and the Arts. She will present on “Who needs violence when you’ve got bullying, stereotyping and relational aggression in children’s TV sitcoms?” at the Comparing Children’s Media Around the World Conference, University of Westminster, Harrow, UK. Dr. Jennifer Stoffel, Fayette, published a co-authored paper titled “Soil Microbial Community Response and Recovery Following Group Selection Harvest: Temporal Patterns from an Experimental Harvest in a U.S. Northern Hardwood Forest” in Volume 340 of Forest Ecology and Management. Stoffel has been promoted to associate professor and granted tenure. Dr. Betty Whitesell, Fayette, was promoted to professor and granted tenure.